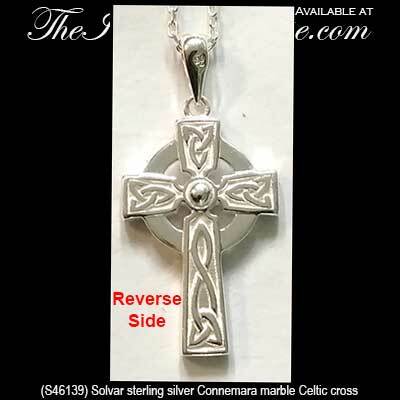 Celtic cross pendant is crafted in sterling silver with inlaid Connemara marble; it is a suitable size for women. 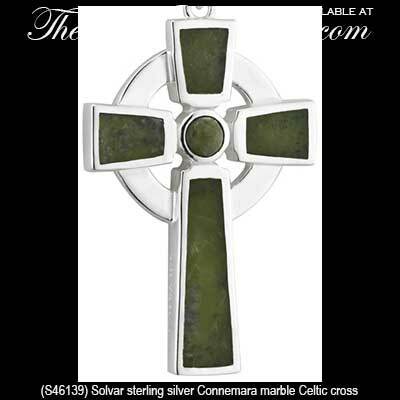 The inlaid Connemara marble that is part of this silver Celtic cross is the only natural green marble in the world; fittingly, Connemara marble is only found in Ireland. This Celtic cross necklace in sterling silver features inlaid Connemara marble and it is further enhanced with engraved Trinity knots on the reverse side of this double sided pendant. This Celtic cross pendant measures 1/2” wide x 1 1/8” tall, including the jump ring and the chain bail, and it includes an 18” long sterling silver chain. This piece of Irish jewelry is gift boxed with Celtic cross, Celtic knot and Connemara marble history cards, complements of The Irish Gift House. The Solvar Jewelry Celtic cross is part of their Fáilte Ireland Collection; it is made in Dublin, Ireland. 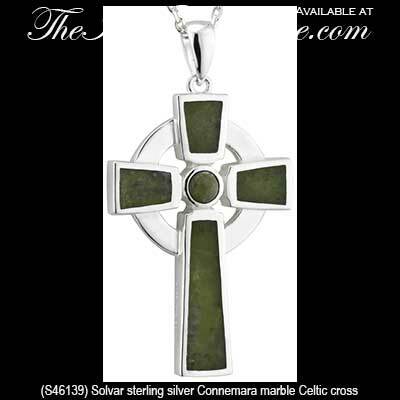 Sterling silver Celtic cross pendant with inlaid Connemara Marble is a large size that is suitable for a man. Connemara marble cross necklace features sterling silver construction that is enhanced with a marcasite stone and Celtic knot-work. Silver Celtic cross features inlaid Connemara marble. Connemara Marble Celtic cross necklace is cast in sterling silver; it is enhanced with the Claddagh icon in the center. Sterling silver St. Brigid's cross necklace features inlaid Connemara marble.